This is a great article from the New York Times that is worth Sharing. There’s an old saying: If you want to make a small fortune in the wine business, start with a large one. Many a wealthy person has discovered the axiom’s truth the hard way, buying a winery with the idea of being a gentleman farmer, overseeing a picturesque and prestigious business, with the added bonus of living atop a hillside covered with vines. Reality often intervened. The long-term capital investment, large fixed costs and delayed revenue — there are at least six years between planting vines and having a wine ready to sell — either forced the dreamer out of business or turned the enterprise into a charming but money-losing hobby. But today’s Napa and Sonoma regions, still the epicenter of American wine, are increasingly populated by a different breed of hardheaded types. They created serious wealth with their first career and have no intention of treating their second one any differently. Charles J. McMinn, the founder of Covad Communications, with a 2013 estate cabernet sauvignon at his Vineyard 29 in St. Helena, Calif.
For people looking to have their names on bottles, there are many ways to go, and prestige rises with the level of commitment. On the starter end of the scale is a club like the invitation-only Napa Valley Reserve, whose 500 members can participate in creating a limited-edition wine every year under the supervision of the team behind the cult favorite Harlan Estate. Or they can just show up to enjoy the fruits — after putting down a refundable deposit of $155,000 to $175,000, along with dues and the cost of their wine allocation. Then there is the “custom crush” route: Would-be Mondavis get their hands on grapes (buying them or growing them) and rent a winery and team to make the wine, in that way avoiding the fixed cost of a large facility. A high-priced consultant can help. Finally, there are all-in types like Charles J. McMinn, a venture capitalist who founded and sold Covad Communications before the tech bubble burst. He was typical in the way he started his wine country life. That was in 2000. These days, Vineyard 29 produces 10,000 cases a year across nine wine varieties, mostly made from Napa vineyards that Mr. McMinn owns. His Vineyard 29 Estate Cabernet Sauvignon 2013 won a coveted 100 points from the critic Robert Parker. Despite stumbling into winemaking, Mr. McMinn said he saw Vineyard 29 as a start-up, something he had much experience in, albeit in a very different industry. Industry experts say there was a sea change that can be traced to the more highly competitive landscape after 2001. Victor Leon, a cellar supervisor, in one of the caves at Vineyard 29. Bill Price, a private equity specialist who was a founding partner of TPG Capital, has jumped into the wine business with gusto. He owns high-quality Sonoma parcels like Durell Vineyard and founded the wineries Head High, Lutum and Three Sticks. He is also the lead investor for two well-regarded estates, Gary Farrell Vineyards and Winery, and Kistler Vineyards. The huge growth of the wine industry means more competition now, Mr. Price said, but certain technological advances have changed the game in favor of savvy newcomers. The logistics of shipping can be outsourced, as can website design and legal compliance. He said that rule held true for his own properties. The newer brands Lutum, Three Sticks and Head High “are still on that treadmill to glory,” Mr. Price added with a chuckle. Mr. Frank, the former Disney executive, compared his trajectory to those of others in Napa Valley. “I may have started in the one camp and ended up in the Chuck McMinn camp,” he said of his level of investment, which increased up over time. Mr. Frank bought a home in Napa’s Rutherford district in 1990 that came with a vineyard, and for a while he was happily maintaining it and selling off the grapes. It was “no harm, no foul” as a business proposition, as he put it. 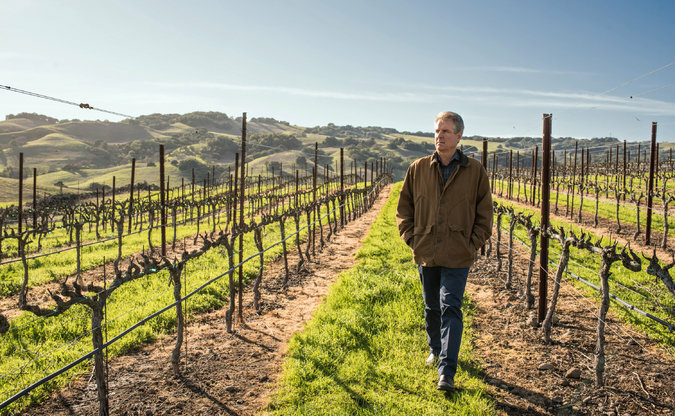 Then, with a partner, he bought an existing winery and turned it into Frank Family Vineyards. It produces 75,000 cases a year. Mr. Frank called it “very profitable,” especially for his higher-end wines, but noted that slow growth was essential. “This is not a profit-and-loss business, it’s a cash-flow business,” he said, because it requires constant re-investment. Because distributing wine is a complicated, expensive and state-by-state affair, Mr. Frank’s other piece of advice was that starter wineries must be able to sell to people on the premises. “If you don’t have a direct-to-consumer business, it’s a money pit,” he said. Despite being in Napa for decades now, Mr. Frank has never quite left the hard-charging Disney boardroom style behind. Four years ago, on his honeymoon in Italy, he spent part of the time on the phone, negotiating the purchase of a prime, 80-acre vineyard in the Rutherford district. Ted Loos is the wine and spirits contributor at Travel & Leisure.